In this 40 minute radio interview, Extraordinary Renditions author Andrew Ervin spends a needless amount of time discussing freedom. There are also inappropriate jokes. Andrew Ervin appeared on The Bat Segundo Show #361. 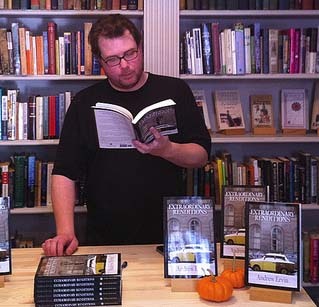 He is most recently the author of Extraordinary Renditions. Condition of Mr. Segundo: Contemplating alternative forms of freedom. Ervin: What else do we have but politics to write about? Ultimately. Whether it’s on a personal level or a cultural level or a national level, politics is going to play a part in every element of our lives, I would imagine. You were asking me about anger recently and I think that gets back to Brutus, who is a very angry character. And he’s the way that I found a voice from my intense anger about our political realm in America. I mean, what’s going on is disastrous to me. We’re still an incredibly racist nation. We’re still an incredibly sexist nation. And this character gave me an opportunity to voice that in some way. And it may be a bit over-the-top. It may push the radicalism a little too far in some regards. And perhaps I tried to mediate that with some of the other characters. But I’m not sure. Correspondent: But with Brutus, you are very clear to point out that he has a good deal of materialistic hypocrisy. Correspondent: Here’s a guy who goes ahead and he complains about blowing money. He complains about getting ripped off by the hotel and then he’s blowing money on fast food and Tom Clancy novels. And also that shopping trick he makes, where he’s totally fleeced. So for a guy who is in this really terrible and probably not very well-paying occupation of setting rat traps, and for a guy who is really anti-corporate and inflamed and into a possible post-Black Power situation, he is decidedly hypocritical. That his ultimate engagement with politics is actually a way of him getting lost further instead of finding that identity he wants. Ervin: Is it still hypocritical if we’re aware that we’re participating? I mean, can we ever get completely outside of the system that we’re trying to critique. We can write the great environmentalist novel of our age, but it’s still going to be printed on bleached paper and packed into trucks and carried across the highway system. There’s always some participation in what we’re critiquing. No matter what. My hope is that I’m aware of the extent to which I’m working within a system to critique it to some extent. Not that I have a specific political agenda with this book. I don’t. I really don’t. Every critic that I speak to wants to ascribe one to it. And they tend to be different ones, depending upon whom I’m speaking to. Which is kind of nice. But there’s definitely an awareness both on my part and, I believe, on Brutus’s part — there’s no getting away from what we’re critiquing. We are also participating. Ervin: (laughs) Yeah, would you please? Correspondent: The thought I had here was maybe fiction serves as this container for you to examine our participation in the system we’re critiquing. Because it is, in itself, a container. And I did actually want to bring up some of the descriptive details about containment. You refer to “the ceiling of the sky.” There’s the Coca-Cola sign that is on the top of the apartment in the third novella. So this leads me to believe that this is indeed a preoccupation. But maybe we can tie in how you arrived at this walled in description with another query about whether fiction is the best way to create a dialogue about this issue. Do you think it is? Ervin: I’m not sure that fiction is privileged in any way in speaking to those issues. If I could play piano, I would try that. If I could paint pictures, I would do that. I’d be willing to break out an interpretive dance for you. Ervin: If you think you can record that. I don’t know what fiction can do in relation to the other arts or any means of expression or nonfiction or poetry. They all play a part in whatever we’re trying to say. Fiction is just what works for me personally. And I don’t want to claim that it has some kind of privilege. It’s what I do. Correspondent: Well, in terms of the description of characters walled in interiors, why do you think you’re so focused on this? I mean, you do use “the ceiling of the sky.” That is a very clear indicator that no matter where one goes, one is going to find one’s self in some kind of interior. Even walking outside. Ervin: Are you telling me that you don’t feel that way? Correspondent: You’re asking me to confess perspective versus description perhaps. And maybe that’s the tension we’re describing here. Ervin: I guess a large part of what this book is about are the restrictions that are placed on us by social organizations and political organizations. The barriers we put on ourselves. The limitations we’re wiling to put on our own imaginations very often without even knowing it. And this scares me. This frightens me a great deal. That we don’t know how free we are. And we participate in these polite little conversations in front of microphones. And we go out in public and follow the rules. And go where we’re supposed to go and buy what we’re supposed to buy. There’s some part of our humanity that we’ve lost touch with. We’ve lost something that is vitally important to who we are. We’re all so damn polite now. Ervin: And if my characters are constrained some way even by their natural environment, that may be the reason. Because I feel like we are constrained. Correspondent: And yet you associate this freedom with violence. The end of the second novella has a very specific line about freedom. “This was something that he had not perceived for so long.” And to my mind, that is extremely interesting. Because on one level, what your freedom might be or what Brutus’s freedom might be — and then I think in my mind, Franzen’s idea of freedom, which from my standpoint is very much endorsing the exact system that you’re trying to critique. So since freedom is really a relative term, is it even a term to dwell on? Is it possibly too general a term? Does fiction, by way of ambiguity, allow one — either the author or the reader — to find not necessarily a solution, but at least an understanding of this dilemma that we’re describing? Ervin: How are we going to know when we are free? I mean, that’s the question. Is it just opening up one more barrier and seeing a slightly bigger horizon? There’s no way for me to be able to answer that. The moment you’re talking about at the end of the second novella, with Brutus on the bridge over the Danube, I think references the [Frantz] Fanon book he’s reading. He’s carrying around The Wretched of the Earth. This great book in many ways about the curative power of violence. And to try and conflate my personal political agenda, if I have one, with that is a mistake, I think. That’s not me. That’s this one character who may have a more enlightened view of the world than I do or a more limited one in some way that I’m not sure. But freedom is not — I mean, what can you say? Who knows?